Awakenings in Italy | "PJ LIVE!" Florence is an incredible and inspiring city! Since we did not have near enough time to see all of Florence, we elected to hire a guide to take us around so that we, at least, captured the essence of the city. Laura, our guide, met us at our hotel. From the moment we met her, she radiated love for her city. She was also well versed on both its art and history. Our first stop was the Uffizi Gallery of Art. Paintings and sculptures by artists such as Botticelli, Michelangelo, Leonardo da Vinci and Raffaello grace its many halls. Hall 15 displays the works of Leonardo da Vinci. It was in that room that I had an epiphany. 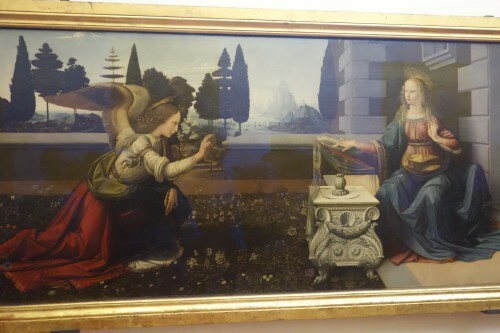 We stopped to look at Leonardo’s painting of the “Annunciation.” It depicts an angel announcing to Mary that she would bear a son who would be the Messiah. Standing directly in front of the painting, I immediately noticed that Mary had a halo, was finely clothed in 15th century Florentine dress and sat in front of a beautiful Florentine house with the Tuscan country-side in the background. There was no evidence of the true Mary; a poor Jewish woman living in the God-forsaken village of Nazareth. As I continued to look at the painting, Laura sidled up next to me and asked, “Don’t you think that the angel is too big and that Mary’s outstretched arm is way too long? It’s out of scale.” She went onto say that some people think that Leonardo’s “Annunciation” is evidence of a young artist who had yet to fully learn his craft. I am no expert when it comes to art. Lord knows, I can’t even draw a stick figure. But clearly, even to one ignorant of the intricacies of fine art, the painting was out of scale. I looked around for Laura to continue the discussion. She had moved away from me, but was signaling me to join her. When I did, I was no longer standing directly in front of the painting. Laura and I were standing to the right of center. “Look at it now,” she said. Looking at da Vinci’s painting from that angle, the angel was perfectly in scale and Mary’s arm looked to be exactly the right size. 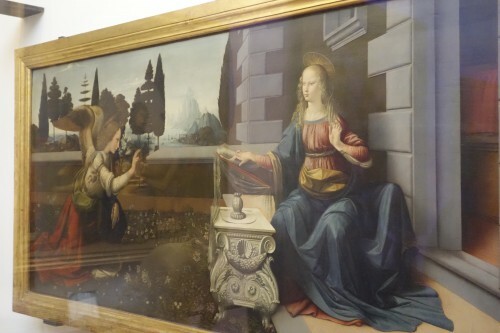 As Laura explained it, Leonardo meant for the painting to be looked at from the right side, not from in front of it. When Leonardo da Vinci painted the “Annunciation”, he may have been a young painter, but he was already a master. Later on that day, Laura took us to the Academia to view Michelangelo’s “David.” Standing at the foot of that brilliant sculpture, it is clear that one of David’s hands is huge. It is completely out of scale. Like da Vinci’s “Annunciation”, however, Laura explained that Michelangelo sculpted the “David” to be displayed 65 feet above the ground. 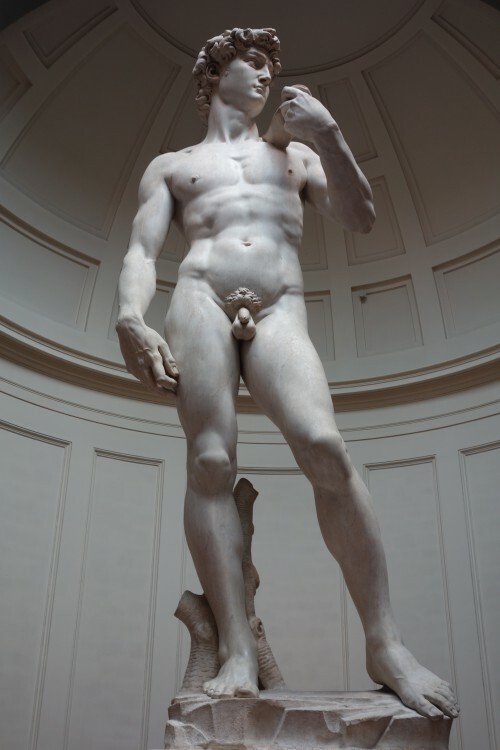 “From that angle,” she said, “David’s hand is perfectly in scale.” To view a painter or a sculptor’s work, to capture its full essence, is truly a matter of perspective. My epiphany, however, was not exclusively related to works of art. “Holy Molly!” I thought, “Could it be that my faith is built upon only one perspective of God? Have I have missed the fullness of God by only standing directly in front of what was painted for me by my church? What is amazing about this sculpture is that, unlike Leonardo da Vinci’s “Annunciation” and Michelangelo’s “David”, there is no one way to look at the sculpture. It has no front or back. There is no correct angle upon which to view it. It cannot be limited to any single perspective. You quickly realize that there is no beginning or end to the sculpture. It moves you to continually circle around it, even as it draws your eyes to the heavens. The God that we seek has the characteristics of Giambologna’s magnificent sculpture. God has no beginning and no end. God is not limited by our human perspectives. The true God is never out of scale as long as we lift our eyes to the heavens and circle ever closer to the God whose love and grace is not ours to lose.